I'm excited to introduce Danielle from Mostly Food and Crafts as the first guest poster on Morsels of Life! Danielle often shares tasty eats, and I know I can always look forward to her bookmarks every Saturday. There's always some tasty treat or fun craft. :) So, without further ado, let's welcome Danielle and her scrumptious recipe - Caramelized Baked Chicken Legs! Hi Everyone! My name is Danielle and I blog over at Mostly Food and Crafts. I blog mostly about cooking for and with my family. I am so excited to be guest posting here at Morsels of Life today. I would love it if you stopped my blog to say "Hi" and check out some of my other recipes and crafts. 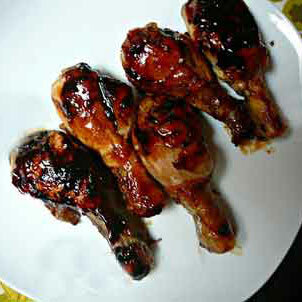 Delicious and easy Caramelized Chicken Legs the whole family will love. I wanted to share an easy and tasty dish with you all. My blog is about finding recipes to make for the entire family (and including the kids in the cooking most of the time). I refuse to serve a dish for the kids and a dish for us so I am always looking for ways to please the entire family. Here is a dish that does just that. When we eat chicken, my kids usually fight over the legs. As far as they are concerned, if you have the legs you don't need to use a fork, and eating with your hands is the best thing ever. I guess that's true right? I had them in mind when I made dinner the other night...chicken legs for everyone! I didn't think it through though because if the kids are going to be eating with their hands I probably should have skipped a messy recipe like this. Oh well - it's worth it to me just to watch them enjoy their food and listen to the sweet little "mmm" that slips out when they take their bites. These Caramelized Baked Chicken Legs were really good and they had the perfect amount of sweetness without being too sweet. The aroma was great too. The only thing I might do differently next time is add some crushed red pepper to the grown-up portion - I think this would have been great with a bit of a kick. Hubby and Sweet Girl like to play "guess the ingredients" at the dinner table. Usually they get the ingredients correct, but this one somehow threw them for a loop. Are we the only family that plays these silly games? Tell me something fun or quirky about your dinner traditions....enjoy!!! Place chicken legs in a baking dish. Mix together the oil, soy sauce, ketchup, honey, garlic, salt, and pepper and pour the mixture over the chicken. Bake in oven for one hour, or until sauce is caramelized. Why does the cooking time say 20 mins, but under "Method" it says cook for an hour?